Gujarat has “topped” the list of 10 most sought-after destination states for foreign direct investment (FDI) in 2015 in a comparison drawn between India and China by a new report by the Financial Times Group's thinktank FDI Intelligence. The report says, Gujarat "attracted $12.4bn and claimed 10% of all capital investment into both countries." 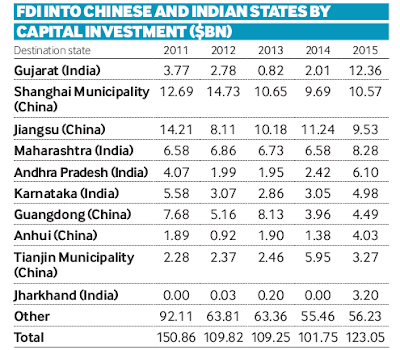 "In 2011, Gujarat was ranked the 14th most popular state for FDI within the two countries", the report says, adding, "Maharashtra in western India has been one of the strongest performers across the years and it has continued to close the gap on the top Chinese destination, Shanghai Municipality, with the locations attracting $8.3bn and $10.6bn, respectively, in 2015." However, the report, titled "The FDI Report 2016: Global greenfield investment trends" does not say how much of the "committed" investment has actually fructified. 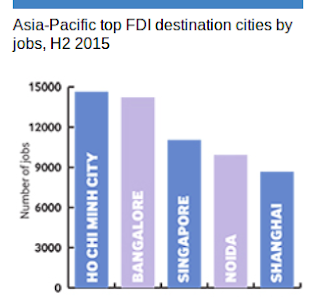 In fact, a separate FDI Insight analysis does not mention Ahmedabad, Gujarat's business capital, or any other city of the state, among top ten FDI job creating cities in the Asia-Pacific region. It says, with 15,000 jobs, Vietnam’s Ho Chi Minh City was "the regional leader in job creation over July 1 to December 31, 2015", adding, "Not far behind was the southern Indian city of Bangalore, which came second as a destination for FDI jobs, with 14,223 created over the same period." "Singapore came third as a FDI destination for jobs, with 11,042. Noida, in the Indian state of Uttar Pradesh, came in fourth with 9,922 and Shanghai took fifth place with 8674", says the report. Praising Prime Minister Narendra Modi for making India and Gujarat No 1 destination, the report says, the factors which led to this included pushing into the backdrop such factors like "lack of progressive FDI reforms, retrospective taxation, excessive permit requisites, centre-state political stalemates, inflexible labour markets, land acquisition issues and inadequate infrastructure hindered large-scale FDI into India prior to 2013." Praising Modi his "campaign" for attracting FDI, the report underlines, it "garnered global attention as he has encouraged foreign investors to privatise key sectors such as the railways, defence manufacturing and insurance, as well as the liberalisation of medical devices." It adds, all this has helped in "ease of creating business." 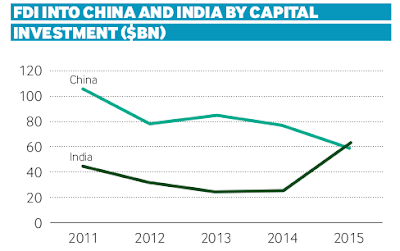 The report says, "FDI flows into India increased from $24bn in 2013 to $59bn in 2015. The floodgates had been opened. India’s dramatic ascension in the global FDI rankings has largely been due to a dynamic Modi-led government focusing on ‘big bang’ FDI and labour law reforms." It adds, "Relative stability within the government coupled with an effort to reduce the stagnating effects of bureaucracy has given foreign investors, across many industries, confidence in India as a remunerative investment opportunity. India announced itself as a global force in the FDI sector as it broke into the top 10 economies in terms of incoming FDI flows in 2014." It praises what it calls "Modi’s marquee visit to New York in late 2015 saw a plethora of US-based CEOs of Fortune 500 companies such as Google, Ford, Cisco, IBM, Lockheed, Marriott, Starwood, MasterCard, Merck, Pepsi, DuPont, Dow and EY hosting the prime minister and citing plans to expand in India. This event turned out to be a causative indicator for 2015 as India moved up to number six in the world for FDI flows in 2015."